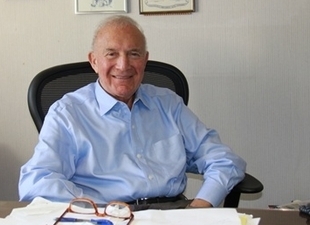 The Hamilton Corp founder and CEO Harold Brown is known for the $1.7B in multifamily properties he privately owns, but he also established a $50M/year construction firm that just completed building a modern radiology facility in a historic building for Beth Israel Deaconess Medical Center. ﻿Hamilton Construction Management designed, engineered and built a state-of-the-art outpatient radiology suite that held a grand opening last week in the 100-year-oldbuilding at 1101 Beacon St in Brookline. One challenge was to install the high-tech medical facility while the imaging center and healthcare facilities that fill the rest of the building continued to operate. Harold’s real estate firm owns the property, but Hamilton Construction won the assignment during a six-month competitive bid process run by BIDMC and its consultant, the Peregrine Gp, says Stephen Weinig, president of Hamilton Construction Management. 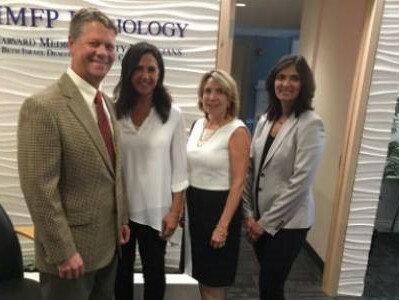 (With him are: Samara Tilkin, architect; Annamarie Monks, chief administrative officer of BIDMC's Department of Radiology; and Dr. Tejas Metah, Director of Breast Imagery at BIDMC). All-new HVAC and electrical distribution systems were installed; plumbing and life safety upgraded; the space reconfigured; and new finishes, mill work, lighting and furniture placed, Stephen tells us.